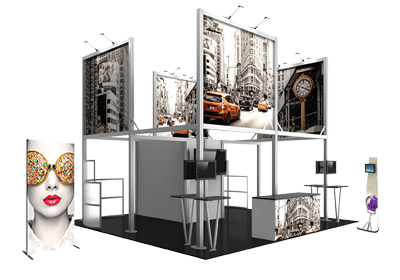 Maximize your real estate with a double deck exhibit and create stylish and semi-private meeting spaces on the tradeshow floor! 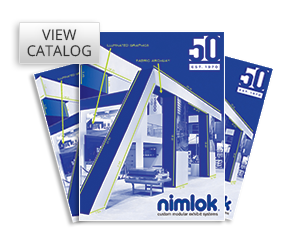 This engineer-certified exhibit system features heavy-duty aluminum construction, high-strength components and is made in the USA. The secure double deck system is designed for easy setup, requires minimal tools and takes an average of four laborers eight hours to assemble. 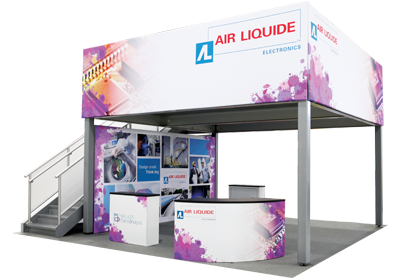 The rental deck system requires a booth space larger than 20' x 20'. Deck hardware includes stairs and railing with texture acrylic infills on staircase. The maximum occupancy on the second floor of the deck is nine persons. Purchased fabric graphics clad the deck with a sleek, sophisticated and polished look. Choose from a complete graphic kit to "dress the deck" or select graphics desired a la carte. Hardware for graphic attachment is rentable.